As I am currently in 4th Year of Engineering , I understand about the placement tension. Student's really don't know how to prepare for placement exams. They don't the books which can make them pass the placement paper of various companies like accenture, Infosys, Cognizant and TCS and many more. All these Companies have Aptitude as their first round. To clear the Aptitude round you must enhance your Aptitude through the right book and RS Agarwal is considered as the best one. 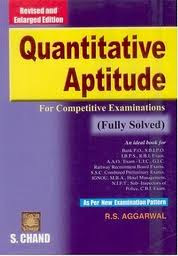 By reading this book All aptitude related problems can be covered. Below is the download link. It's not a hyperlink so please copy and paste this into your address bar. Website from where you can download the book .. If You have any Query Let me know in Comments. Yes, the Password is incorrect. No point downloading it.. Password is correct...because I have the original files. If it's opening here then it will open in ur system too. The rar file also contains english book of rs agarwal. thank u soo much. its so helpful to everyone.